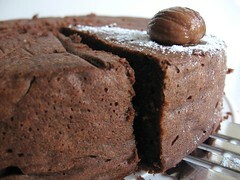 Chocolate Chestnut Cake - Do You Know The Muffin Man? Notes: If you have an earlier edition of this cookbook, it apparently does not mention what to do with the egg yolks. She also doesn't say what type of chocolate: I used a mix of semi- and bittersweet. I used a can of whole chestnuts that I bought from Max's Market a while ago. To make the puree, I chopped them in the food processor along with the vanilla, rum and egg yolks. While it was fairly smooth, there were still little bits of chestnut remaining. I needed about 10 extra minutes in the oven. This (flourless!) cake is moist and not too rich with a nice balance of flavours. Many of my tasters detected an aftertaste; perhaps it's some lingering alcohol?